Shamelessly stolen from Paul Hornschemeier, I wish to celebrate the birthday of the great 20th century humanist philosopher, Bertrand Russell (no relation). I do this by stealing an image that I peered at and poured over whilst visiting Boston’s Fine Museum of Arts, as we used to call it in high school. It’s difficult to see if this small reproduction, but as Russell lights his match in the darkness, he and the flame are both out of focus. What is in focus are his spectacles on the table in the left-hand foreground. I have no idea what this says about the photographer’s take on the subject, or why he chose this image out of the undoubtedly innumerable other shots of the famed thinker, but I found it to be supremely fascinating as an aesthetic choice, and perhaps one of the more subtly profound works in the exhibit. It can be hard to appreciate an exhibit of 20th century celebrity portraiture. It’s all too easy to say, “Oh, yes, I have a postcard of that image of Audrey Hepburn” or “Huhn. So that’s what Nikita Khrushchev looked like…” and to simply move on. Once one recognizes Paul Newman or Ernest Hemingway, what further is one supposed to look for in the image? 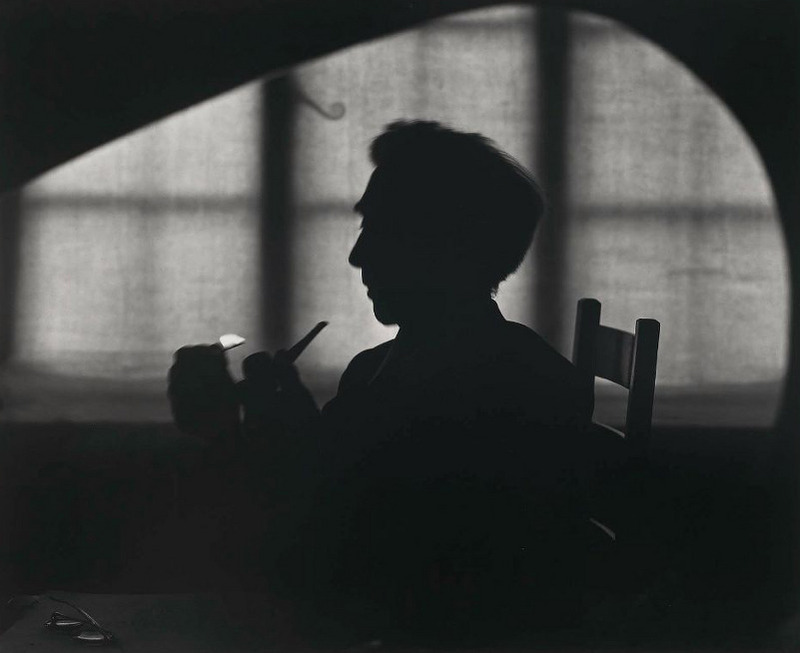 Karsh tried to portray them as powerful in their own right, and in their own sphere. I liked to look for the incidental details that revealed both the passage of time and the humanity of the sitter. Thin, gold wristwatches with the unmistakable slimness that accompanies fine internal clockworks. Thick cable sweaters with worn holes and slipped stitches. A fine network of lines around the eyes and knuckles, so much easier to examine in black and white. How even the meticulous banzai topiary of a moustache or beard always has errant tendrils. How many of the subjects smoked. How many didn’t. And whether the smoke was conceit of the photographer, who surely acknowledged if not encouraged the wisps and curls which do so much to both catch light and contain shadow. But even all that observation and catalogue of detail still doesn’t encompass the artistry that is portraiture. To do that, one must paradoxically see what is unseen, or perhaps only seen with the self and not the eyes. Which is part of what I love about the Russell image… a photograph that hardly shows the subject at all. So far as I know, this is not the traditional portrait of Russell that Karsh's estate typically licenses. If you search for "yousuf karsh" + "bertrand russell" + print, you can find a regal portrait, but not this muted, smoky, mysterious one. And, I should add, the prints that are available seem to be actual enlarged photographs, full silver gelatin prints, and not poster reproductions, and tend to run about three or four thousand dollars.Unfortunately, it seems unlikely that I can help you. The best possibility is taking a look at Karsh's book Regarding Heroes, which has the portrait of Russell on plate 79. That might be the only available paper version of what you're looking for.